I am thankful Family Friendly Gaming was given a digital download code for Sudoku Party on the Nintendo 3DS. This puzzle video game with one thousand puzzles can also be found on the Wii U. Since we have moved over to the Switch we do not do much with the Wii U anymore. We mainly use it to record videos of Wii games. The Wii U has essentially been dead to us for some time now. Back to Sudoku Party. Sudoku Party has the normal one player mode where you solve the puzzle. There is also a party mode where you can compete against others. In addition to all of that Sudoku Party has a competitive mode. Sudoku Party is split between Easy, Medium, Hard and Fiendish. It can take twenty minutes or more to solve the easy puzzles in Sudoku Party. Not very hand held friendly. Puzzles can be saved and picked up later though. 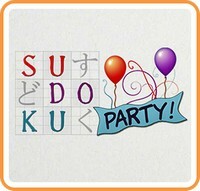 Sudoku Party has three trophies players can earn. The first is to solve the puzzle. The second is to solve it in a certain amount of time (like ten minutes), the third is to solve it without using hints. What are the hints in Sudoku Party? The game can remove any mistakes you made in the puzzle. This can be handy when you are stuck and do not realize you messed something up. The music in Sudoku Party contains an Eastern flair to it. The balloons on the top screen let you know how many of a certain number are left to place. This can be handy when you are trying to solve the puzzles. The background music can be turned off, and Sudoku Party can be changed for left handed input. Lightwood Games is so kind to diverse game play styles. Sudoku Party is challenging. Even the easy puzzles took me twice as long at first. I did eventually learn some tricks and get a bit faster. I was never quite fast enough for that second trophy. I earned the first and last one quite a few times. I decided to ignore that second challenge trophy because I care more about solving the puzzle. It is relaxing for me to take my time. Sudoku Party does not push time limits on us, and I appreciate that.